A neighbourhood of old and new. 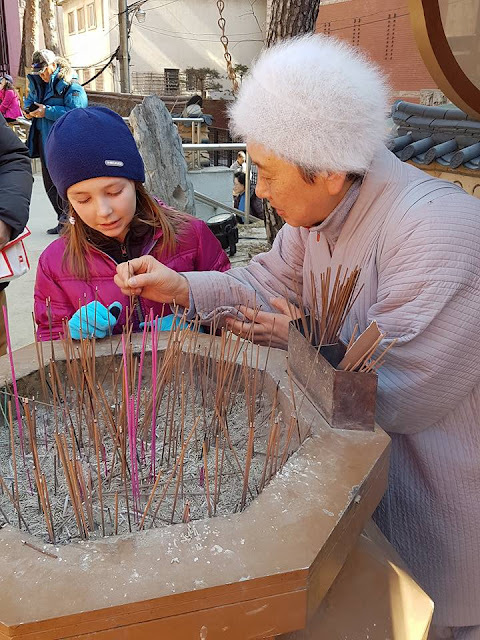 Insa-dong street was traditionally a place for painters to study (dating as far back as the 1300s) and has now become known as a centre for Korean arts and culture. 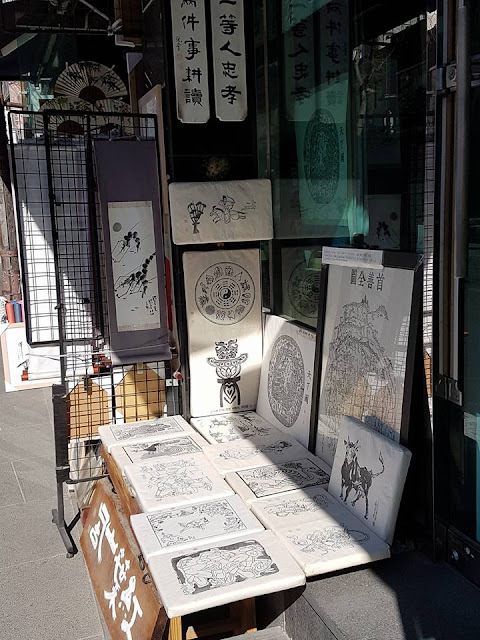 Many artisan shops are set up along the street and narrow alley ways that branch off of the main street. There’s a mix of tacky souvenirs and traditional folk art and crafts including mask carvings, pottery and paintings. I bought a lovely hand painted picture of a scenery of cherry blossoms, which Korea is known for in early spring. There are even shops to rent traditional Korean clothing to wear while you’re out strolling around the area. 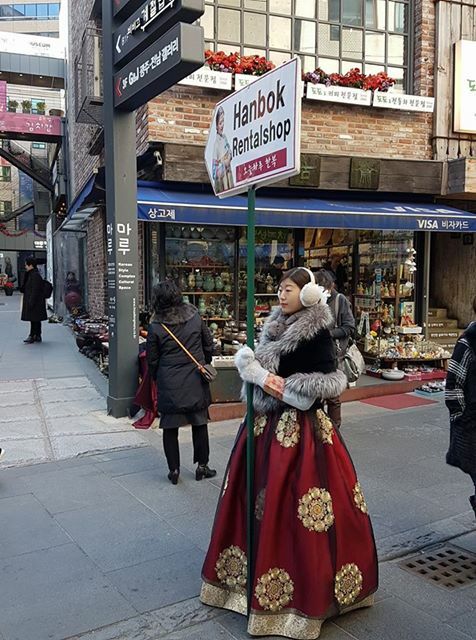 These are called Hanbok dresses, and we saw several women and couples wearing the clothing while exploring Insadong and the Jogyesa Temple. Kids will love to run through the traffic-free street and browse the numerous colourful souvenirs and tacky toys. After much pleading by my daughter, the only item I caved on was a small fabric and wood fan that could easily fit into our luggage! Off of Insa-dong street you can find many restaurants and tea houses where you can experience the tea culture of Korea. Sitting on the heated floors was a warm solace after walking the streets in Korean winter. The menu included several types of teas, including many fruit teas. 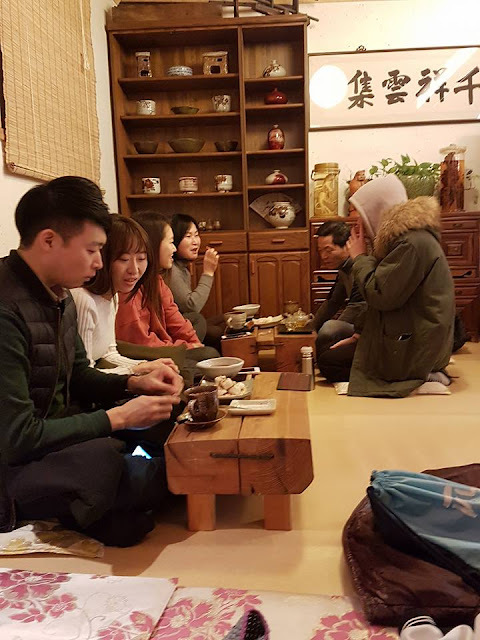 I myself had the Green Plum Tea, a sweet yet tangy flavour which combined with sitting on the warm floors made for a very calming and relaxing experience. My daughter had a cold cinnamon punch tea, which she found a little overbearing in spice! However, to her delight, the sweets served with the tea made up for it! 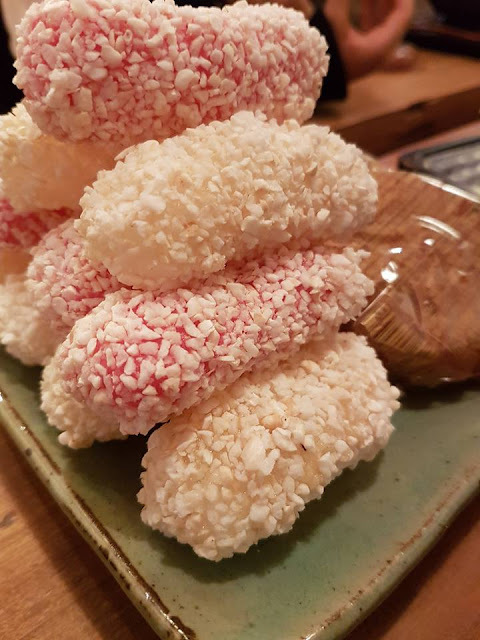 She was thrilled with the puffed rice treats that were not only fun in colour (pink and white), but had a light sweet, almost nutty flavour to them. In accompaniment were pumpkin cookies/cakes that were very dense with a sweet yet slight taste of pumpkin. A big hit with any kids, I’m sure. Within walking distance of Insa-dong Street is the Jogyesa Temple. 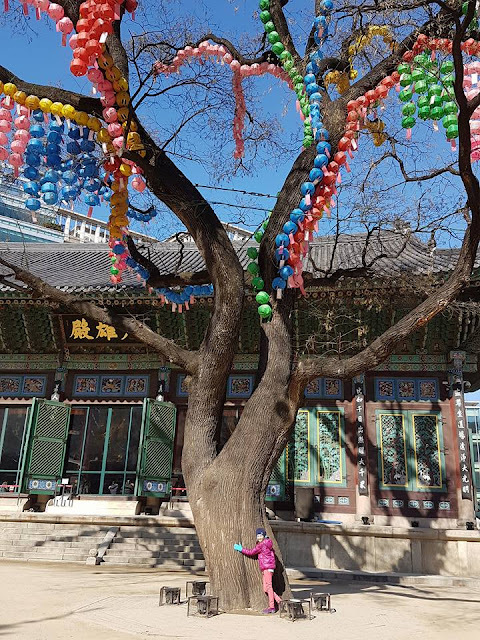 A beautiful temple that almost looks out of place, surrounded by modern high rises, yet is the symbol of Zen Buddhism in Korea. The main hall constructed in 1938 is beautiful and surrounded by 500 year old trees, some adorned with colourful lanterns. 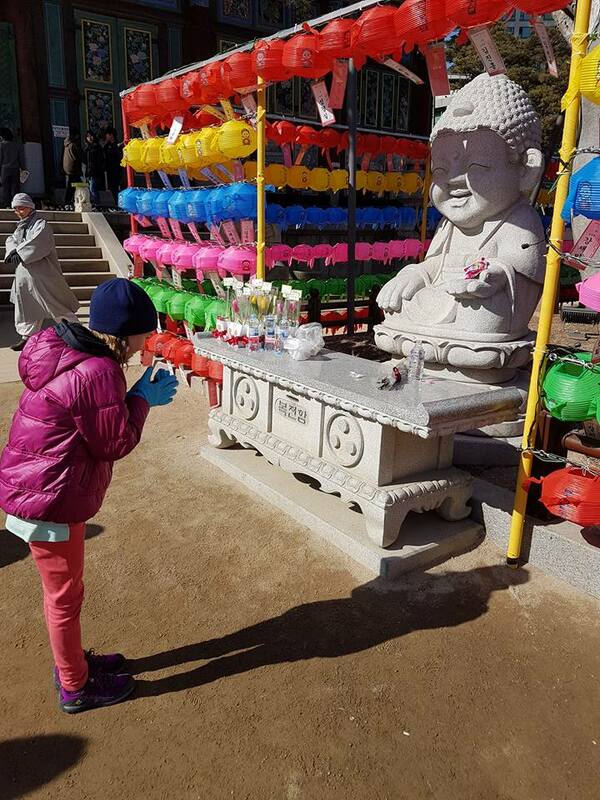 Apparently during Buddha’s birthday, (8th day of the 4th lunar month) the place comes alives and the entire area is visited by thousands of people and adorned with even more colours and lanterns that are to symbolize the transition of wisdom and compassion of the Buddha. My daughter loved running around this area, hugging the trees, praying to Buddha, and even meeting a monk who kindly showed her how to light an incense. We were also allowed inside the temple where devotees were silently meditating or praying. Everyone was very friendly and welcoming and quick to grab my daughter a pillow to sit on. She was in awe of the towering gold statues of Buddha inside and the ornate images and colours in every part of the temple. I watched her taking it all in, more than I took in the surroundings myself. It made for some interesting conversations on what Buddhism is after our visit. Warning: You must be comfortable being NAKED! The Korean bathhouse, or jjimjilbang is a worthwhile cultural experience in Korea for any age. 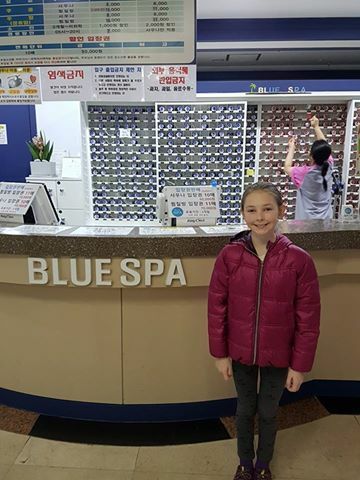 There is a long history of public bathhouses in Korea, and what I found was that Korea’s love to be really, really clean and they take skincare to the utmost level of personal regiments. The bathhouse we visited was called Blue Spa, but there are several out there which are open 24/hours! We were on the 7th floor of a high rise where genders are separated as soon as you pay your entrance fee around 8,000 won or 8 dollars. Once you disrobe and walk through the doors, into the spa area you will find several kilns for soaking in, all at various temperatures and with additives such as tea, vitamins or collagen for that added pampering to your body. There are also rows of sit-down and stand-up shower stations filled with women fiercely exfoliating their bodies, apply skin creams and serums. Through another set of doors you will find a sauna and an area for sleeping (it’s not uncommon for people to spend the night at the bathhouse, especially if they live outside of the city and had a late night). An open area is also in the room where one can receive a massage and major scrub down while naked. I’ve never seen anything like this. Middle aged women dressed in black lace underwear aggressively exfoliate those who dare opt for this experience. The ordeal also involves a massage that includes having your back walked on (there’s handles on the ceiling to support the masseurs!) and your limbs scrubbed and then slammed down several times onto the massage bed. It was hard not to gawk as this! Apparently there is also a mixed gender sauna area, where clothing is mandatory but provided to everyone as cotton shorts and shirts. Once my daughter got over the initial discomfort of getting naked in front of people (as we undressed “mom, this does not feel right, this does not feel right”), she had a lot of fun running around the spa with other children exploring the different temperature baths and daring each other into the coldest one of all while the moms got to sit and relax while their skin was rejuvenated. 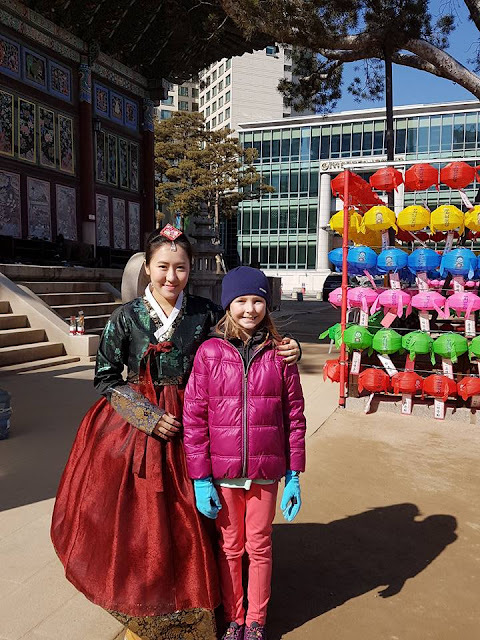 Overall, I highly recommend this authentic Korean experience! Seoul is full of various themed cafes, from play cafes, dress-up cafes, sheep, dog, cat and even raccoon cafes! 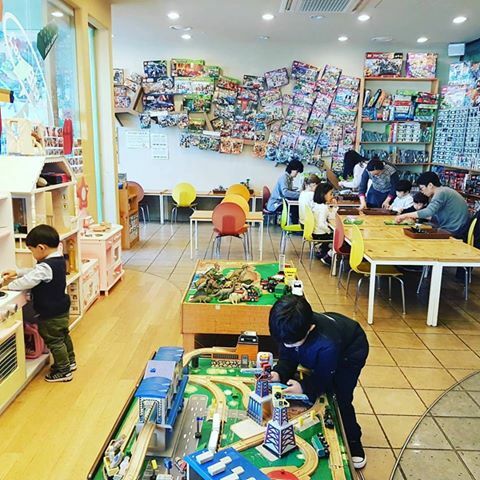 Our friends took us to play cafe called Coco Block, in the suburbs of Seoul. There were various play stations, including trains, dinosaurs and kitchen sets, but the biggest draw is the lego. The walls were lined with every possible Lego and Lego Friends let imaginable. My daughter of course picked a Star Wars ship to build and kept her occupied while us parents got some work done on the computer. Another day I took my daughter to a dog cafe. I have to endure constant whining about wanting us to get a dog, which my response is always NO! HELLO, we travel way too much for us to have to take care of a dog! Alas! A dog themed cafe, where she can play hours on end with any dog she wants in the place! We visited the Wal’z & Joypia (formerly known as Cafe Pawz). We got off at Gangnam Station on the metro and walked a few blocks. There is no entrance fee, however a very pricey drink is expected to be purchased (around 9,000 won or 9 dollars per drink). The only reprieve is to know part of the funds are going to the care of the animals. 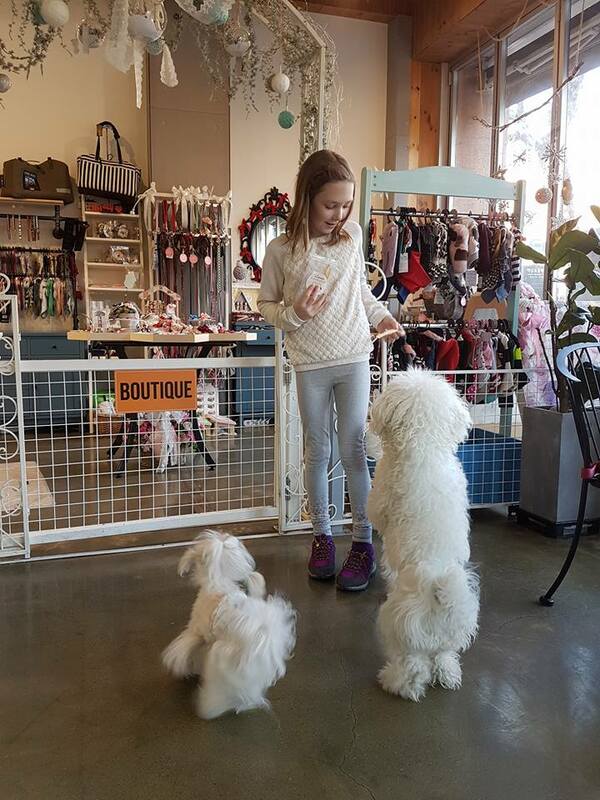 We seriously spent at least 2 hours here- a must do in Seoul if you’re a dog lover! 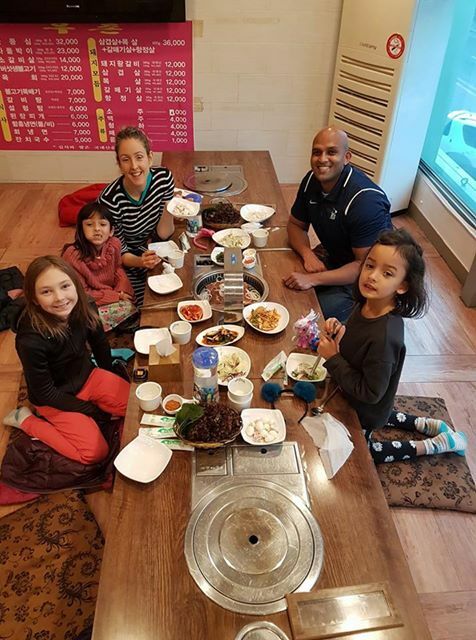 You can’t leave Korea without having BBQ! There are several BBQ restaurants around Seoul. Navigating the menu can be tricky, luckily because we were with friends who have been living in Korea for a few years now, they were able to make our order. You may be able to find restaurants with English menus as well. We had kalbi, which was marinated pork ribs in a Korean soy sauce. All meats or dishes will come with banchan, or “side dishes” which include kimchi, wilted spinach, mung bean sprouts and more of which I have no clue what they might be! All in all it is delicious! 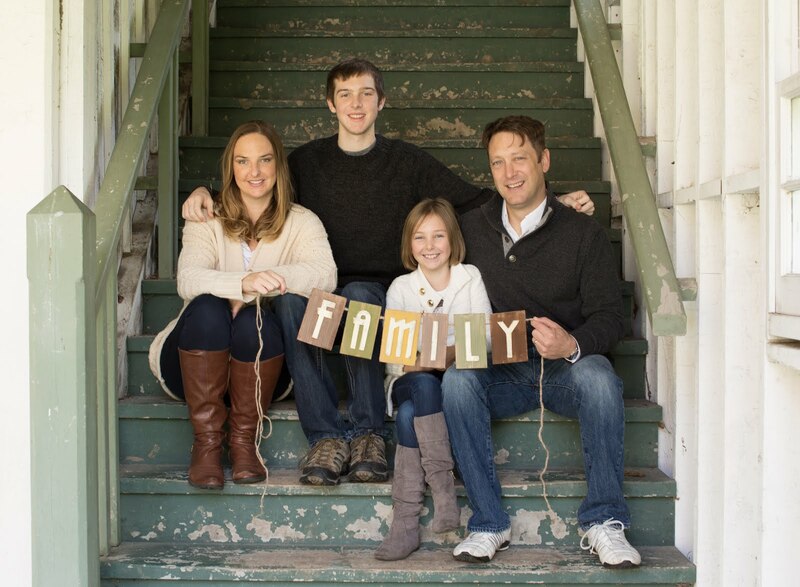 The experience of sitting on the floor and grilling the meat at your own table is exciting for the kids, and if the younger ones want to stretch out or play on the floor… you’re already there, so no big deal! 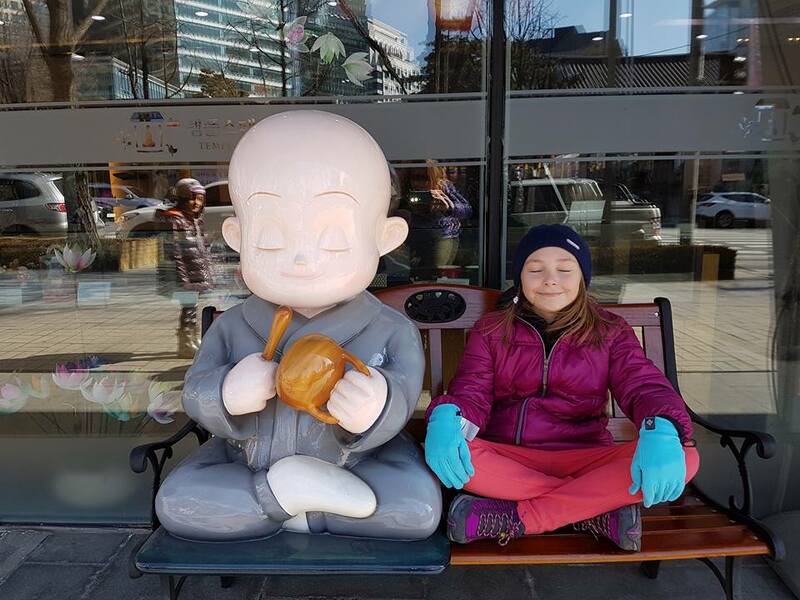 Check out my daughter’s video blog about her time in Korea!